I can't seem to find a way that leads to the pictures without being logged in. They have the location buried deep within the site. I'd love to see your model Pete, but the pictures are broken links. Maybe the dreaded httpS ? East Broad Top #1 was the original engine bought to lay the track in the 1880s. It survived, and was given a new boiler when The Big Cheese bought a Business Car (#20, Orbisonia.) It spent its final days pulling him around the railroad. This is my modified Aster JNR 8550 that I built from a kit. I managed to lose some parts - notably the gasket set, but I soldiered on to get a steam-tight model. It has a new stack, but I haven't done any painting yet to get rid of the JNR red or touch up the bolts. The copper top came from Roundhouse (very inexpensive.) 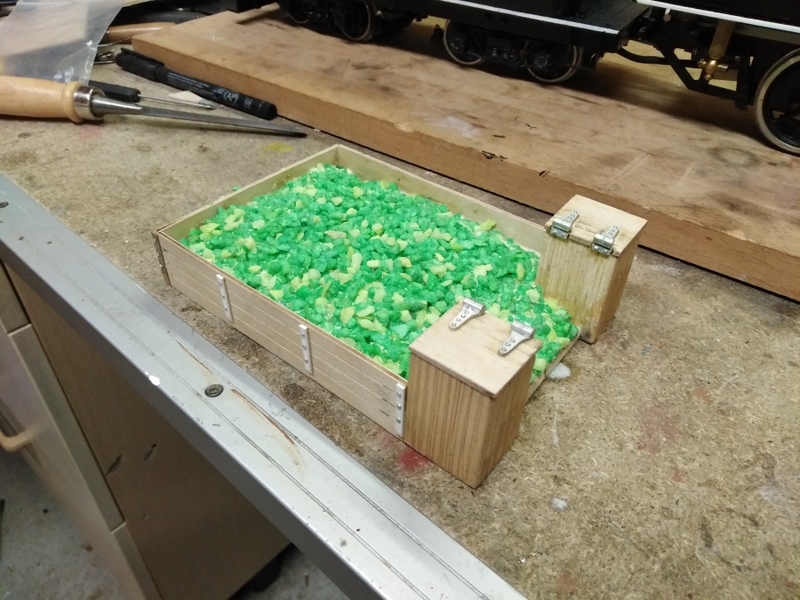 The cab is a Bronson-Tate Forney kit from The Train Dept, and I made wooden walkways to match EBT #1. It needs earlier domes, but I haven't done them. The tender came from an Accucraft 4-4-0, I think, acquired because it was the right size and had the butane tank. I was determined to convert it to butane, and I bought a 30mm Regner ceramic burner that just fit with a bit of bending. I re-used bits of the Aster tender as #1 had a strange 6-wheel arrangement. The conversion isn't particularly successful, as you can't see what is going on. I need to run a suction fan until there is enough steam for the blower, just like an alky, as there isn't enough room for the gas to escape? It does run on rollers, so more experimentation is needed on the track. Deltang powered Tx's such as my RCS Dual Use range with a standard Deltang Tx2 module come with Ch #1 set to 100% of throw (90º) all other channels are 150% (135º). Channel # 1 is normally used for the regulator and Ch # 3 for the reverser. Whilst servo throws can be changed as long as the Tx2 core module is set to profile # 2, changing them doesn't necessarily help. The throw options are quite limited. As you suggested in our private correspondence, what can be done relatively easily, is simply reverse the usage of the Channels. Channel # 1 becomes the reverser with 100% throw. Channel # 3 becomes the regulator with 150% throw. In the case of my RCS handpieces just swap the knobs on the handpiece and swap the servos at the Rx. BTW. When using a TX2 core module in profile # 2 only, all the servo controls except Ch # 5 can be reversed. If anyone needs to know how, drop me a line and I will supply instructions that are understandable. 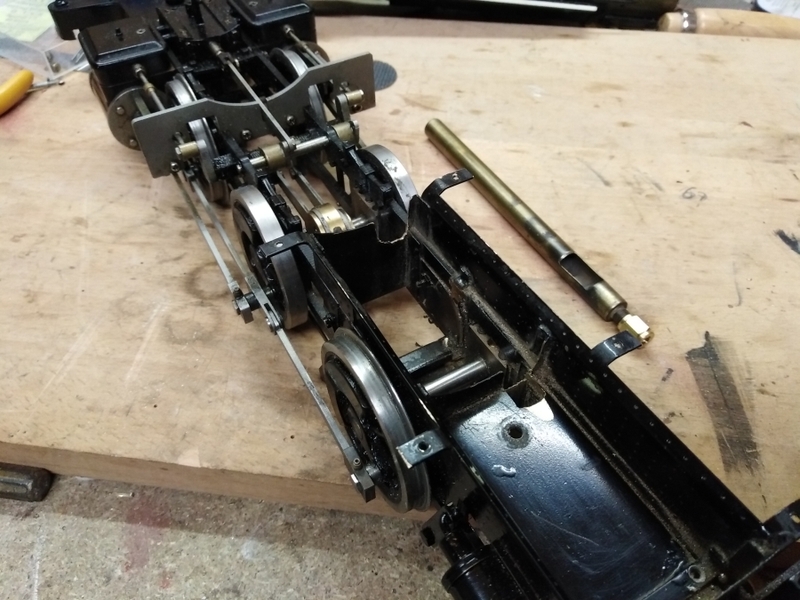 Anyone who has converted a live steam engine to radio control has bumped in to the question of how much the throttle servo has to turn the throttle shaft in order to make the engine go properly. In general, most engines will move on 10-20 degrees of shaft movement, but on an uphill line with 6 heavy coaches you may feel that 180 degrees will be required. 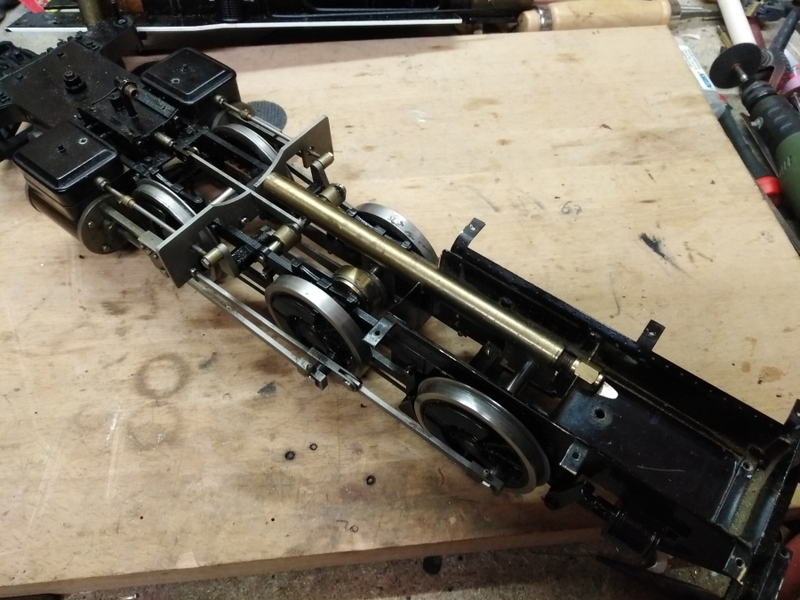 Some years ago I converted my Accucraft C-16 and managed to get about 135 degrees of movement (see below.) My Accu EBT #12 had only 90 degrees as I didn't try anything special, though I recall Kevin saying he wanted 180 to be able to give it a big burst of steam when needed. Most live steamers only seem to need about 90 degrees max to function, though you hear that more might be better. With Jason selling longer tapered fine control throttle shafts, you will definitely need to think about the shaft rotation. 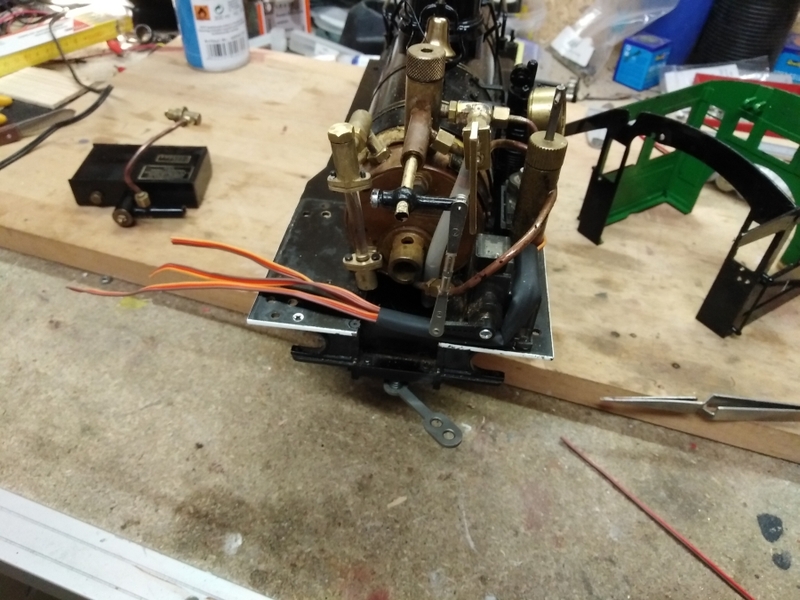 My C-16 originally had a regular servo and a long servo arm connected by a wire to the throttle shaft crank, which was shorter than the servo arm. Simple geometry will show that a long arm moving a shorter one will make the short one move further. I think I got about 110 degrees, but it is tough to go further as you run in to the mechanical problems of such arms. 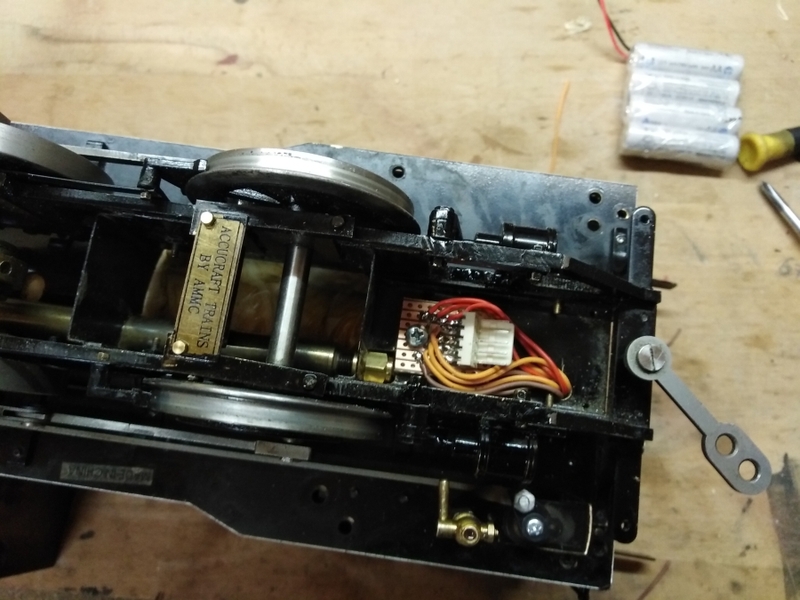 I found a 180 degree servo, and replaced the servo in the C-19. As it turned out, my TX (Deltang TX20) was only sending a 75% move command so my 180 degree servo was only moving 135 degrees! However, it was more than adequate. 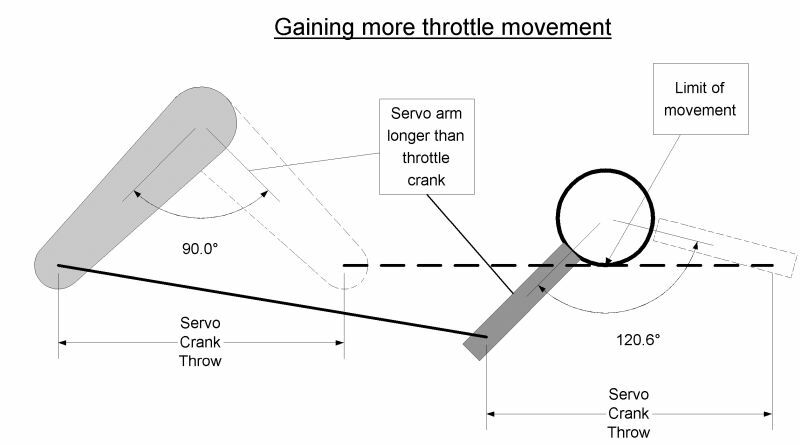 I did research changing the TX to a 100% throttle throw, but it got too complicated and the engine was performing fine, so it was left in that state. Recently I added a throttle servo to my K4 (another thread, when I get time) and pondered the same issue. I found a bunch of servos on aliexpress that promised 180, 270 or 360 degrees of rotation, for the robot guys I believe. However, when they arrived I could see no advantage - most just turned 90 degrees on my test receiver. One did almost 180 degrees - a Futaba S3003 which was supposed to do 270 (as ordered.) More research was needed. It turns (!) out that the pulse sent to the servo (from the RX, under command of the TX) needs to be extended to make it turn more. The throw on the servos can sometimes be adjusted at the TX - the Spektrum Dx6i will allow you to request a 150% throw on any channels. At the moment I have not found a TX that can ask for 200%. Most of the robotic guys seem to be using microprocessors and generating servo pulses in software that are as long as they like. More to come as my musings and research continue. . .
That’s a fine looking engine, Gerd. Your metal working skills are top notch. Thanks for taking us on this journey with you. Would love to see a video of it in action one day. 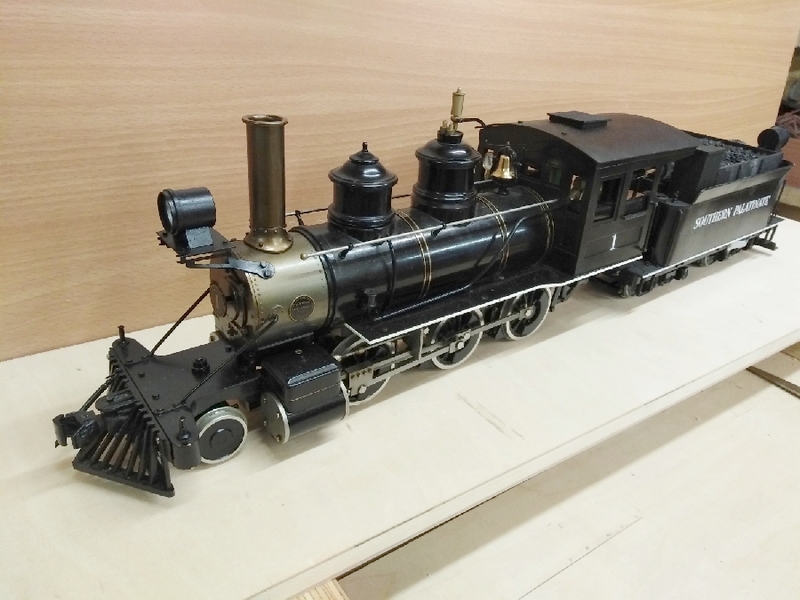 All that work did indeed make a handsome little locomotive. Hello, here's the final report on this project. Since I was not able to get a second headlight which matched the already installed one, I decide to make two new headlights from stock. The parts are made on the lathe and mill. 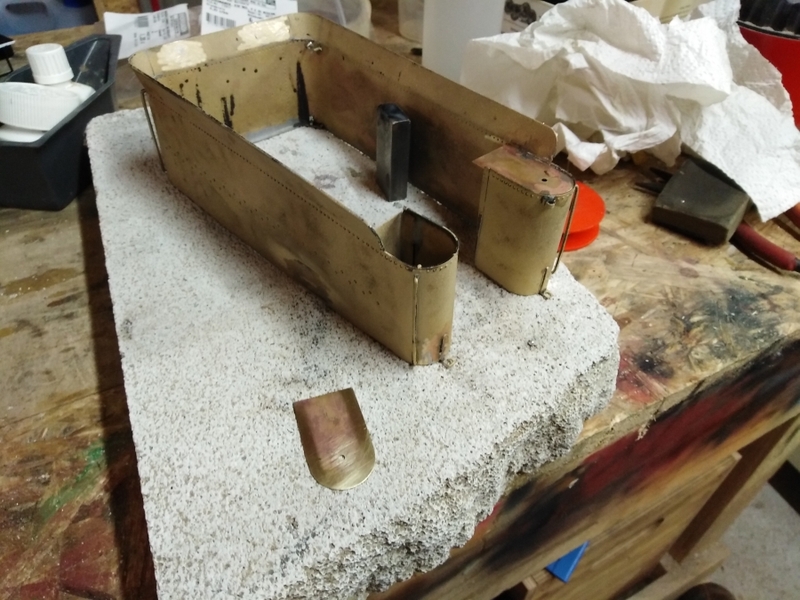 To mount the headlight on the tender, I also made a small pedestal from sheet brass. I also added the lettering to the tender and some detail parts like the re-rail frogs. 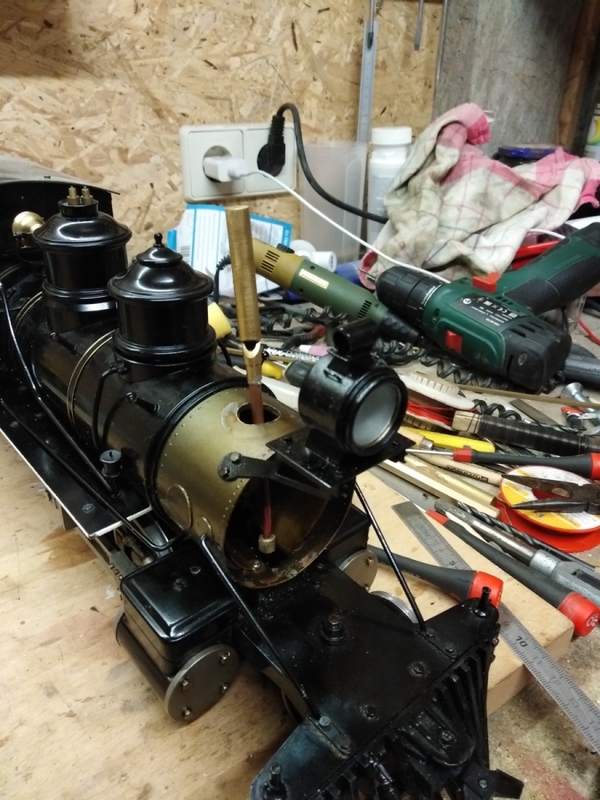 Now the tender is complete and I can start the final tasks on the loco itself. First re moved the paint from the cab to fill in all the holes and cut-outs made by the previous owner. 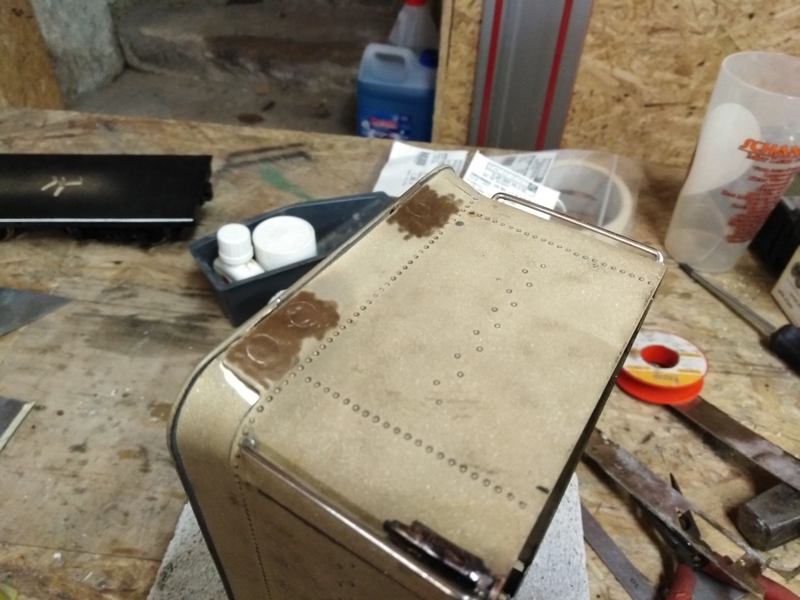 I started with screw-holes on the back. 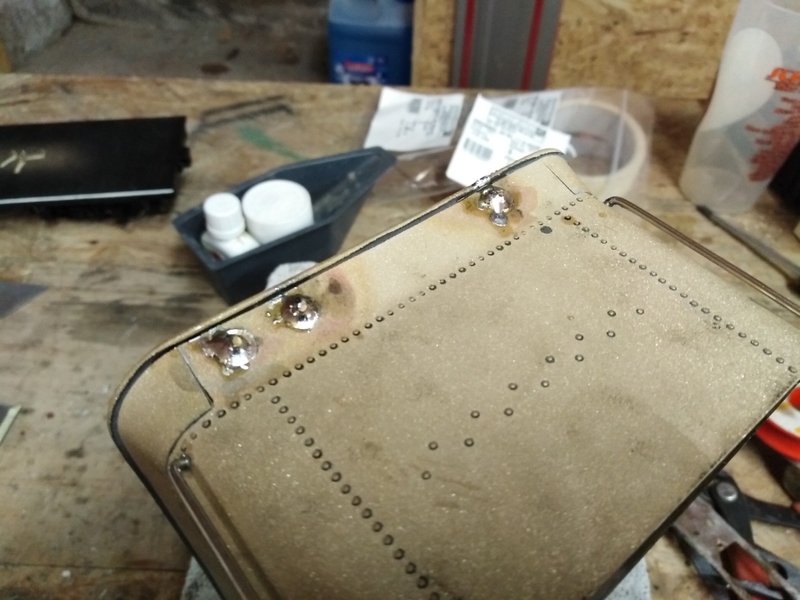 I soldered pieces of brass wire into the holes and filed them flush. Some more work was needed on the larger cut-outs. 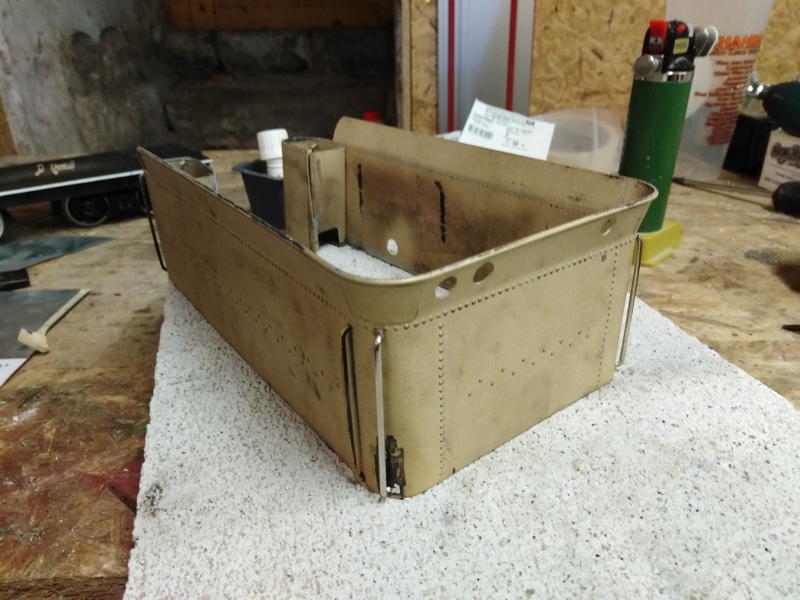 Here I inserted larger segments of brass sheet. Once sanded smoth and painted, they will be barely visible. Once all repaits to the cab were finished, I spend another sand-blast and painted the cab black on the outside and green on the inside. The roof got also repainted. 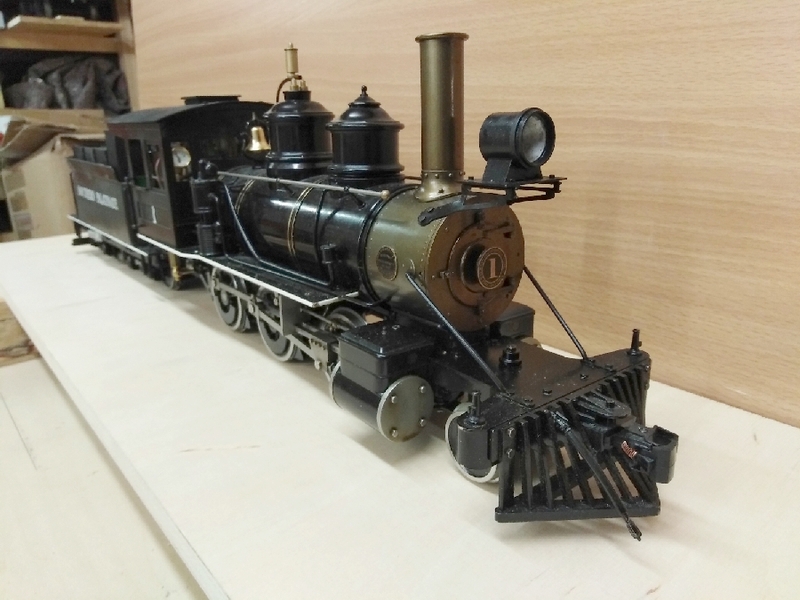 And here’s the finished loco, fully assembled. 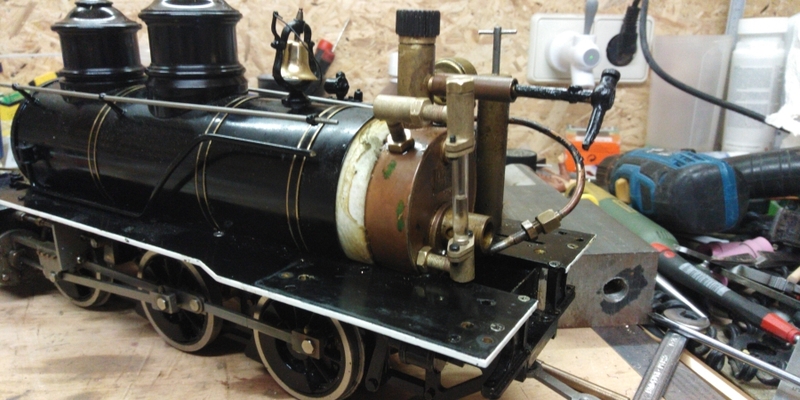 today I’ve the latest progress on the tender rebuild. 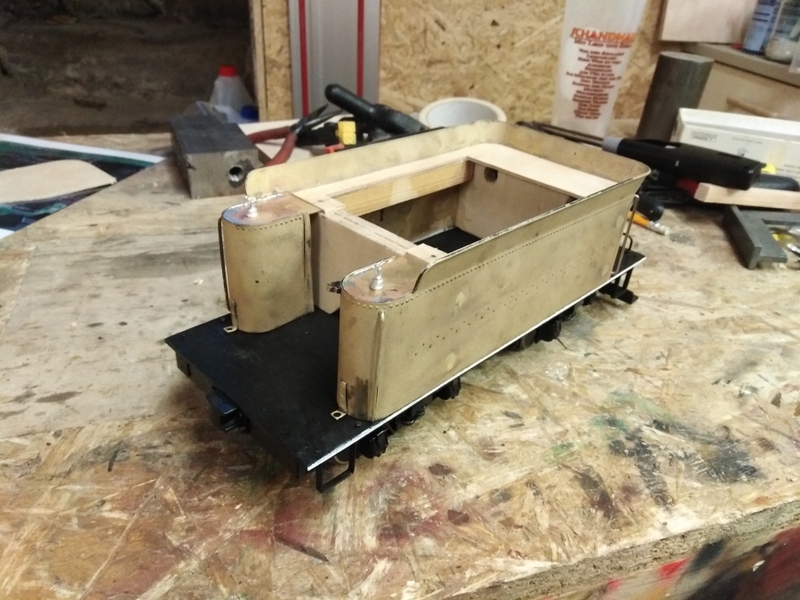 First I added some U channel to the front end of the tender body to add wooden boards which will hold the coal load in place. The coal bunker on top was made from wood and is hold in place by a push-fit. This allows easy access to the receiver and battery inside the tender. The water hatch at the back was made from brass and copper, together with some Ozark parts. 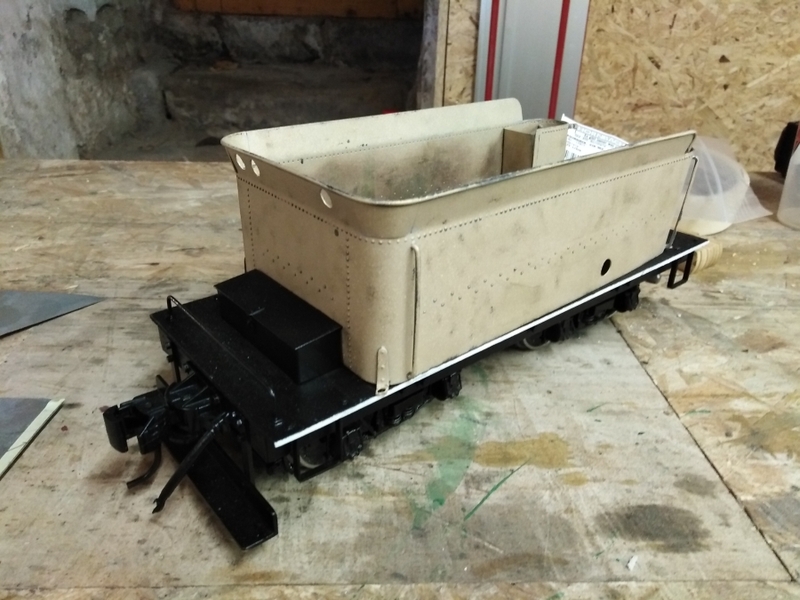 While adding more details to the tender top, I painted the main body and mounted it on top of the chassis. 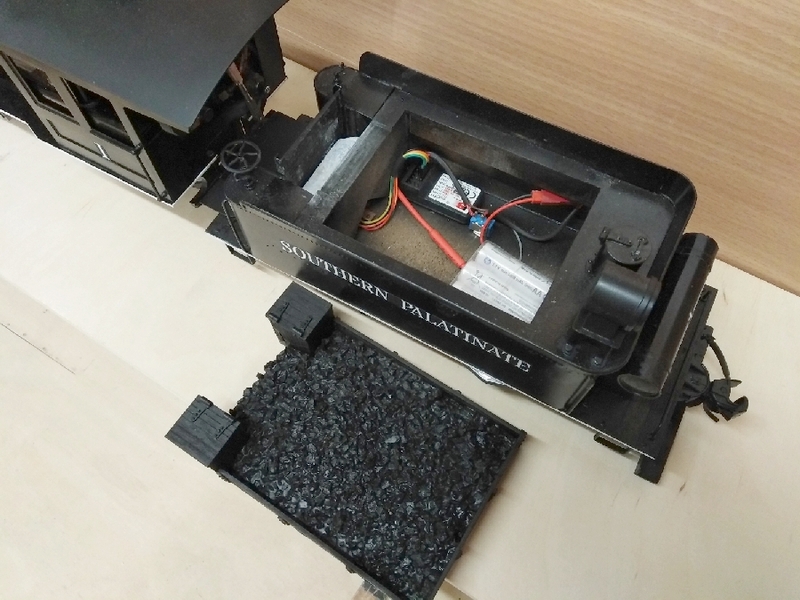 To model the coal, I used some decoration pellets which had the perfect size, but the wrong color. But this got fixed quickly with some paint. And here’s the finished tender together with the loco. Still missing is the rear head light and lettering as well as some details. 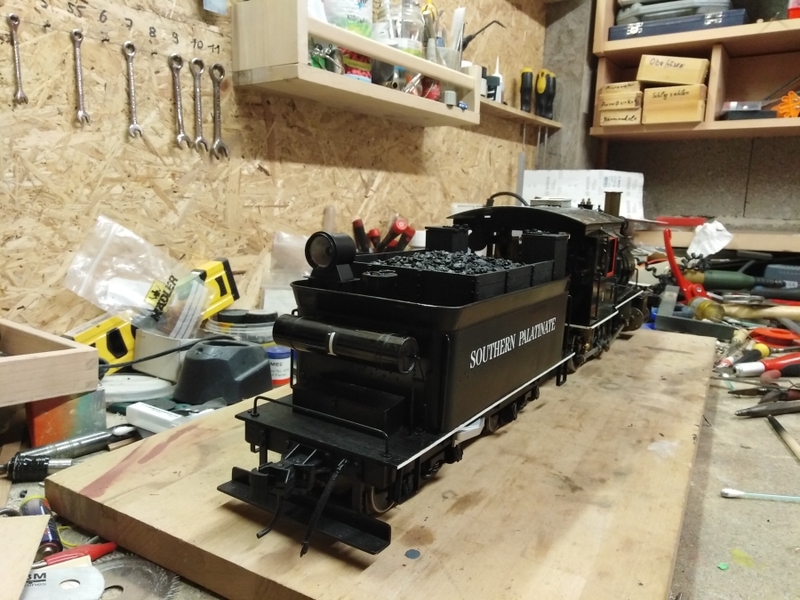 Hello, now the loco is ready for radio control! It took me some time to figure out how and where I could place the servos for the radio control. Finally I found the solution by getting rid of the Johnson bar and turning the reversing-servo upside down. 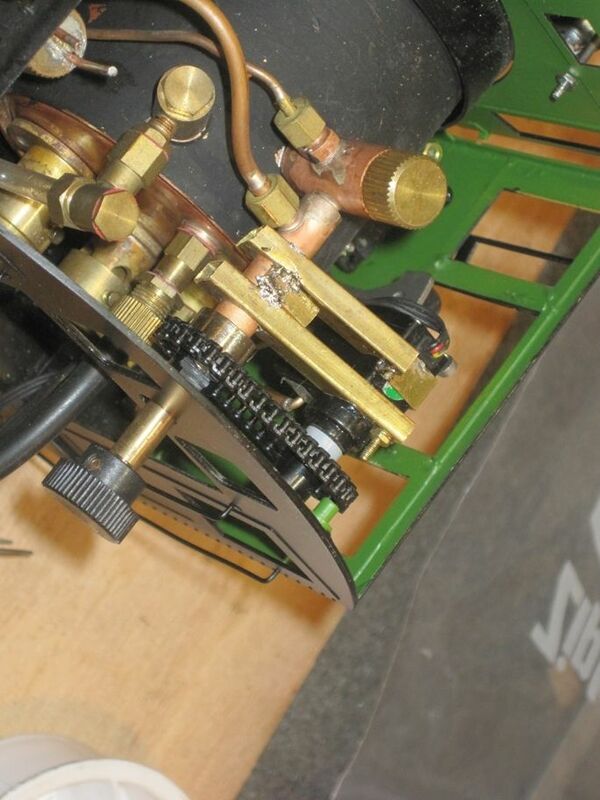 The regulator servo is placed upright and is mounted in a self-made bracket, bend from sheet steel. The lever is sticking out from the back of the cab, but this is okay. 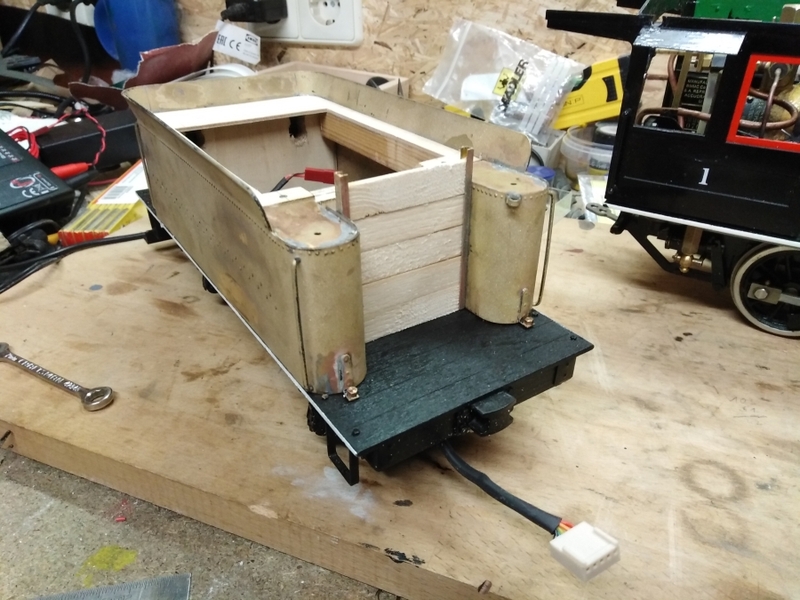 It allows more clearance between the servo and the boiler. 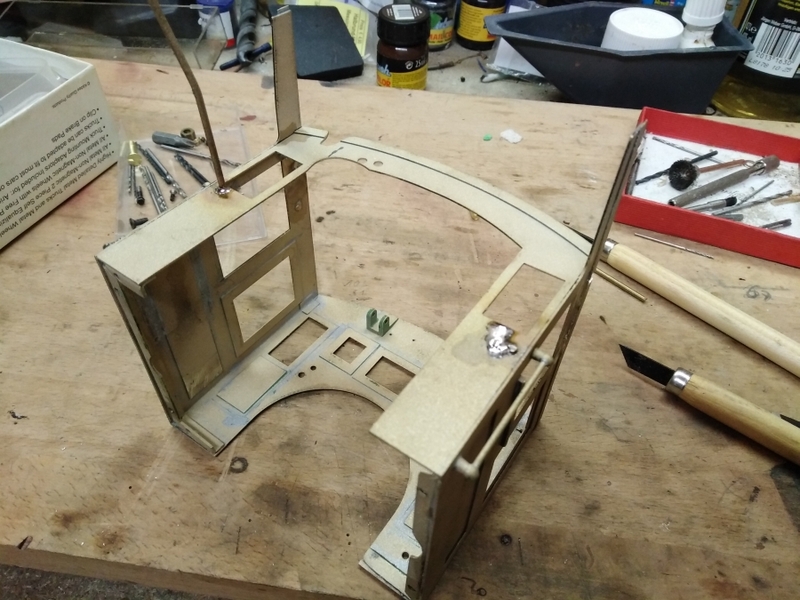 Just beside the servo is the cut out for the reverser servo. Left of the lubricator is the reversing servo, which got installed upside down. The third servo to the right is for the whistle. 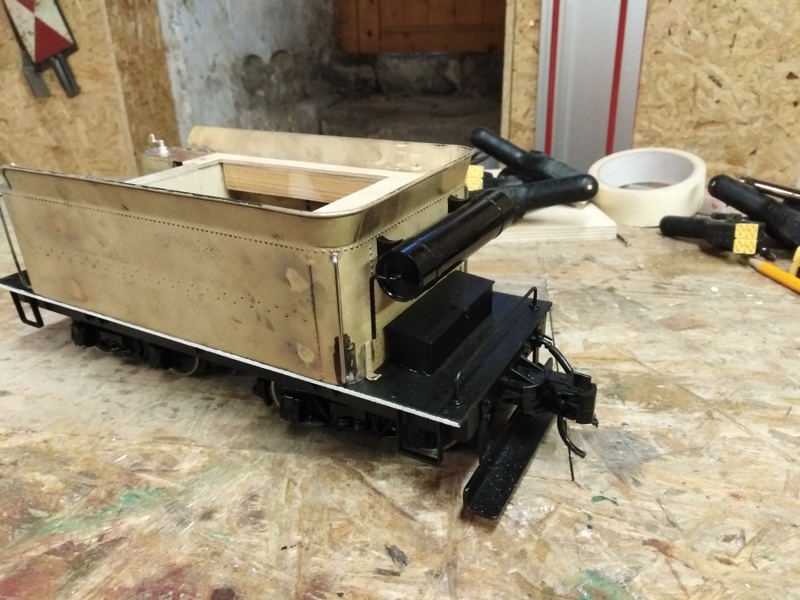 As there was no space left for the receiver (the gas tank will take place on the firemans side), I moved the reveiver to the tender. 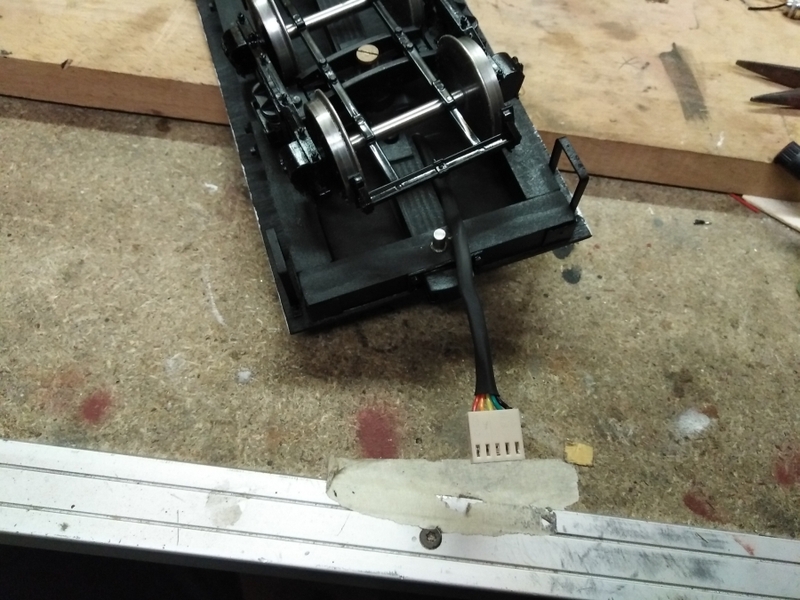 The nine wires of the servos were wrapped in some heat shrink and bend to end under the cab floor in-between the frame. Here I installed some simple PBC with a 5-pole socket and I combined all red wires to pin 1 and all black wires to pin 5, while pins 2-4 are used for the orange signal wires. The tender got the matching cable with plug at the end. To connect the cable with the receiver, I installed the typical plugs at the ends. So it’s easy to change channels if necessary. At least I installed the power switch and made a battery pack ready. 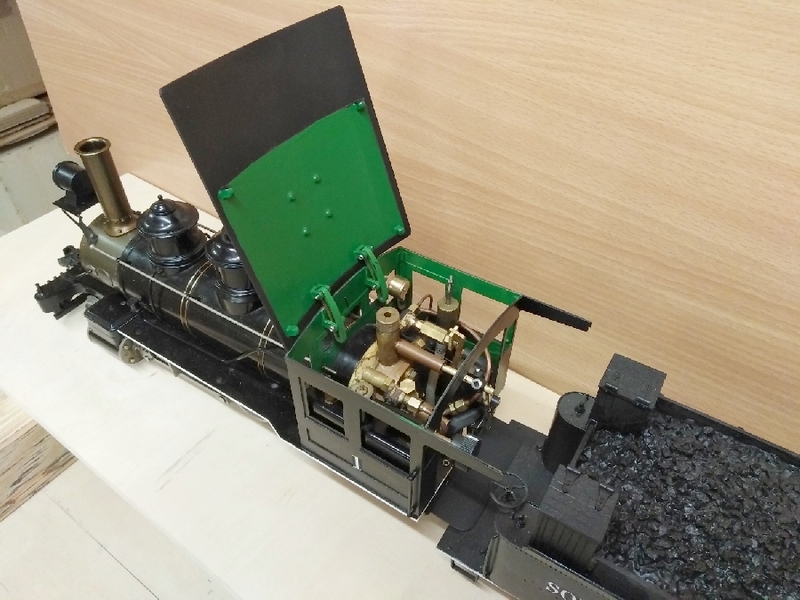 Usually I install a charging socket as well, but I won’t carry the large loco to the charging station each time. 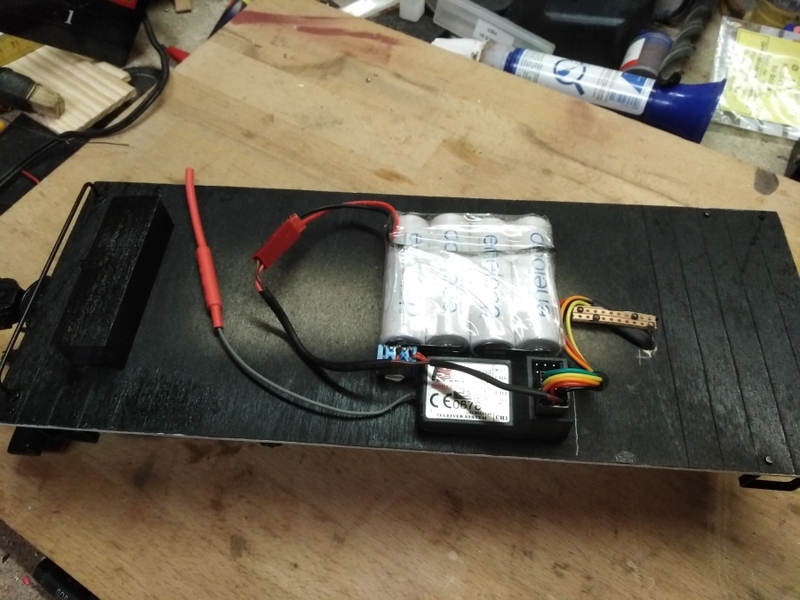 So I made the battery pack removable by plug & socket. 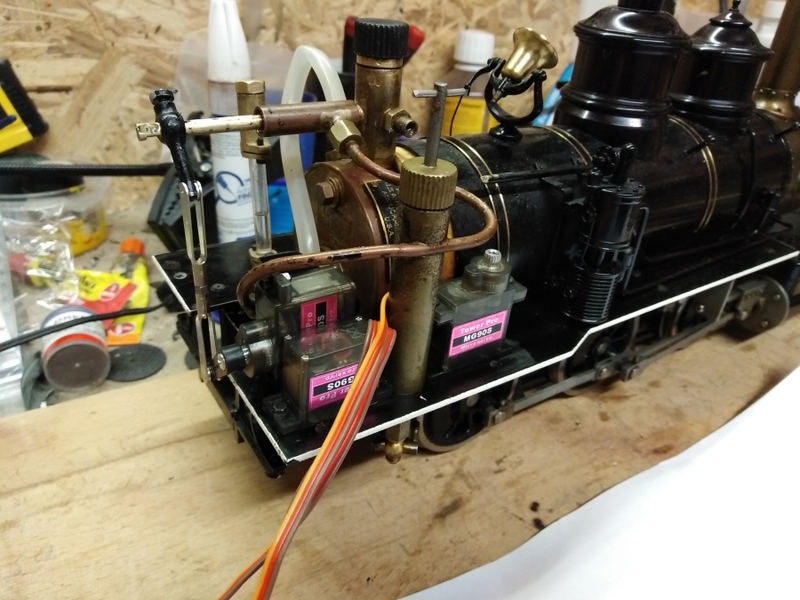 Beside the Rc components, I installed a T-connector with whistle valve between the manifold and the pressure gauge. Unfortunately, I missed to take photos from the progress, but the finished parts are shown in the 3rd photo above. 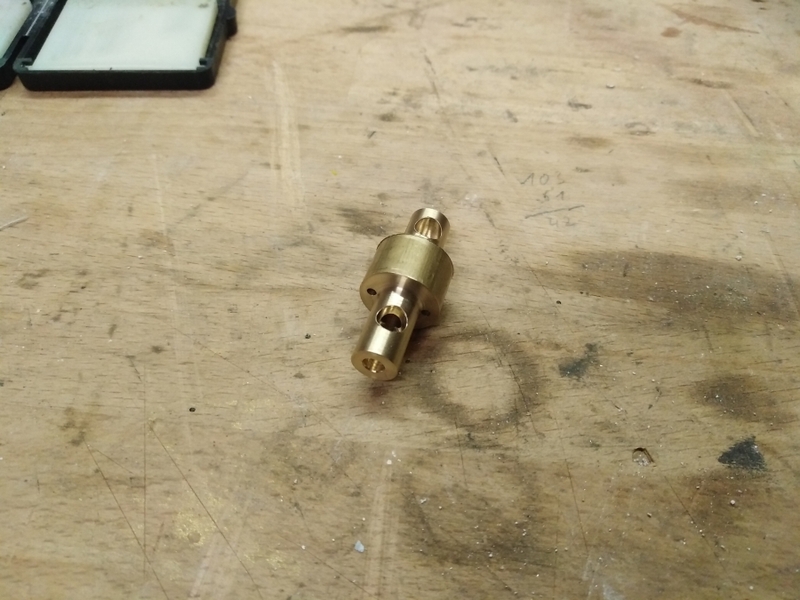 I also swapped the pressure gauge to a 1/2″ diam. gauge. At least I installed a new safety valve. Unfortunately, the weather is bad outside, so I was not able to do test runs yet under steam, but on air, everythign worked fine so far. Yes Dan, all is made from round bar, using lathe and milling machine. 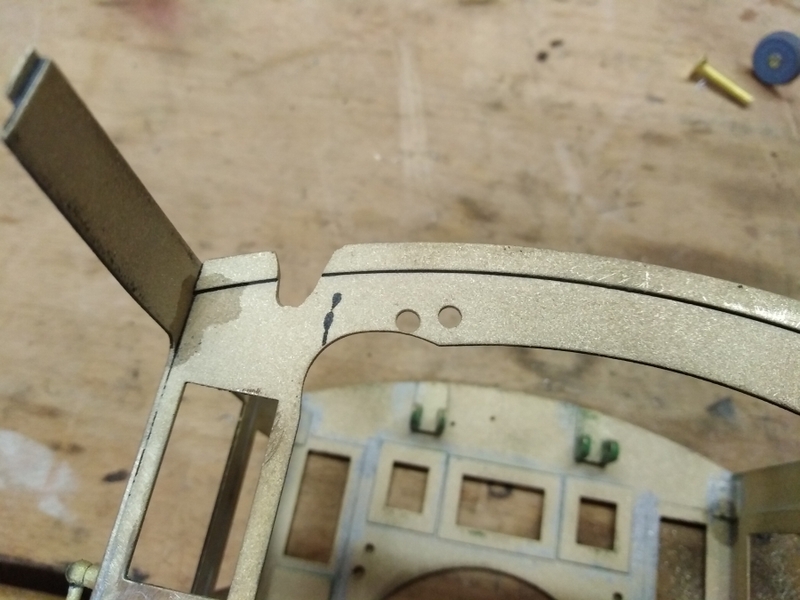 After some research, I found some space inside the frame to install a whistle. I had to do some cutouts at the firebox sheets. Finally I was able to install a long brass whistle here, which will be hidden by the boiler. 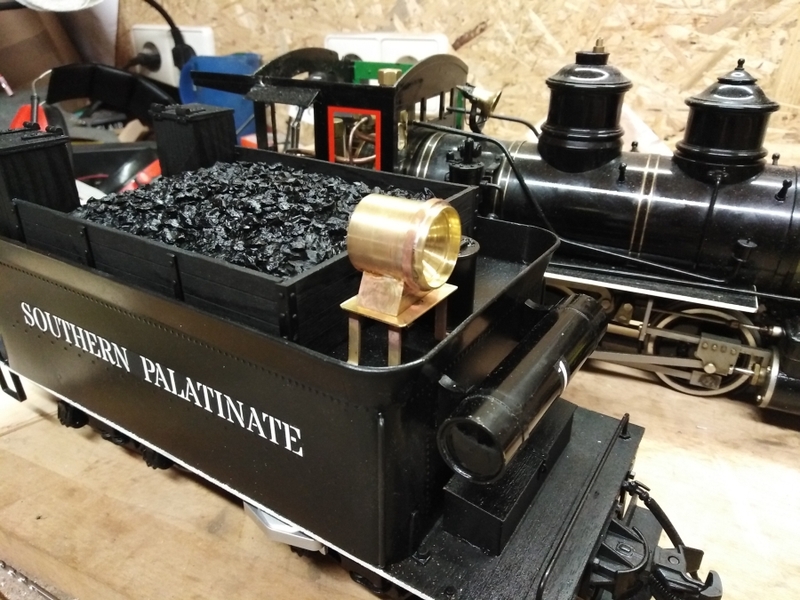 Once the whistle was in place, I mounted the boiler back to the chassis. When installing the steam exhaust pipe, I cracked the fragile threaded end of the thin copper pipe. So I took the advantage and made a new exhaust pipe with a so called chuffer, which is an exhaust chuff sound enhancer. Nice machining work, Gerd. I assume the parts started out as round bar stock? Hello again, I did some progress on my Mogul project. Since the early AC boiler had no water gauge, I made the required fittings from brass and installed a home made water gauge. I made all required parts in one single piece and sliced it into the separate parts at the end of the process. Shape finished, connecting pipes with threads silver-soldered in place and finally sand-blasted. The elbow will be used on top of the boiler and still needs some drilling and taping. 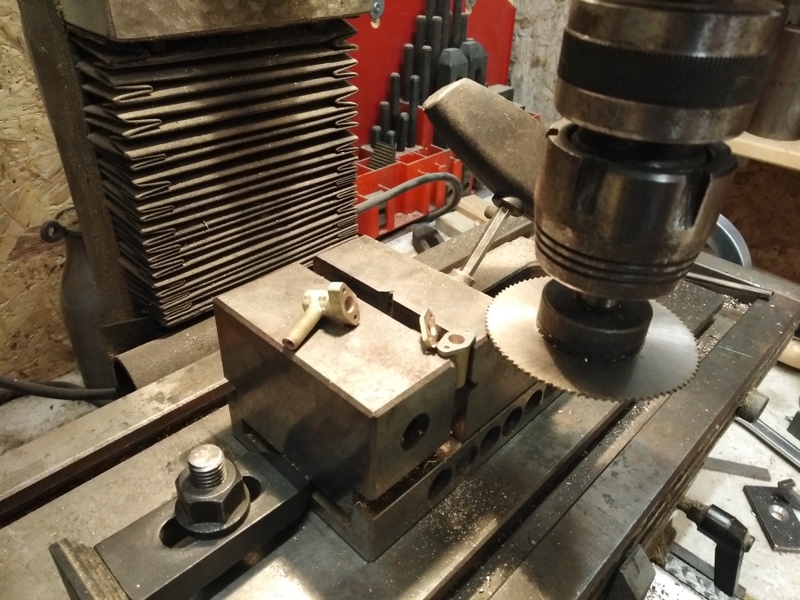 Here I cut the single unit of the fitting into the top and bottom section, as well as into two clamping flanges. Here's the finished water gauge installed on the boiler. 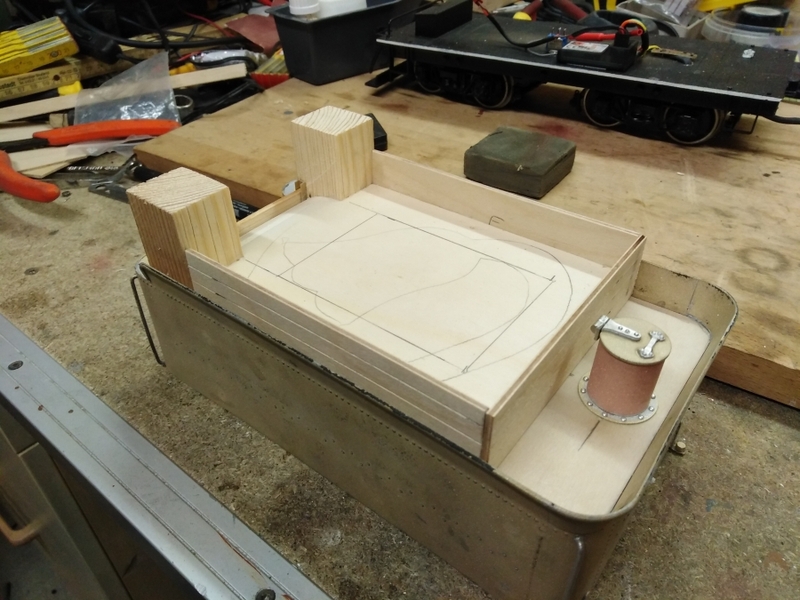 as promised above, here's the latest progress on the tender body. I sandblasted the tender shell to remove all the paint. This makes any soldering action easier and allows some changes to the tender design. The paint was very sticky and it took me some while to get it off. Parallel to the sandblasting, I painted the tender frame, and let the paint rest to dry. On the tender, I relocated the rear hand rails from the side, into the bend, just as on the front end. 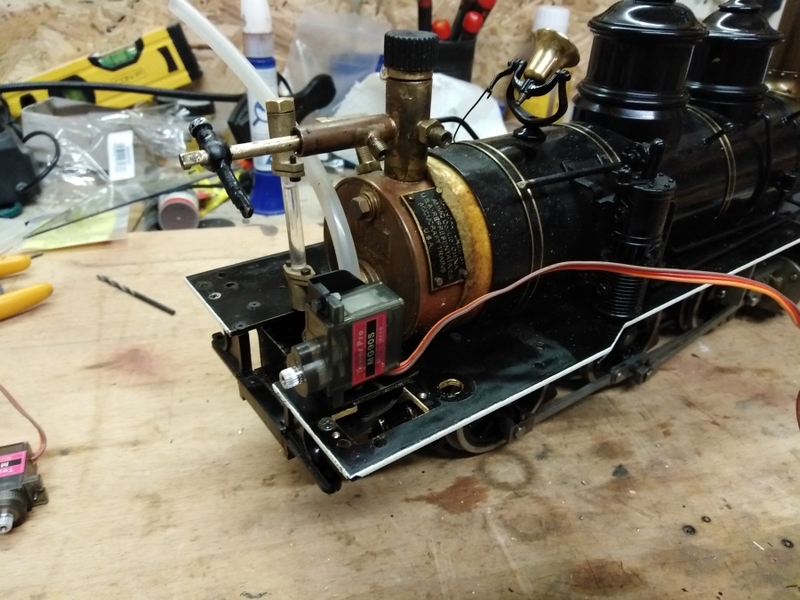 First I soldered new rails in place, afterwards, I snipped the old ones off and filed them flush with the tender shell. 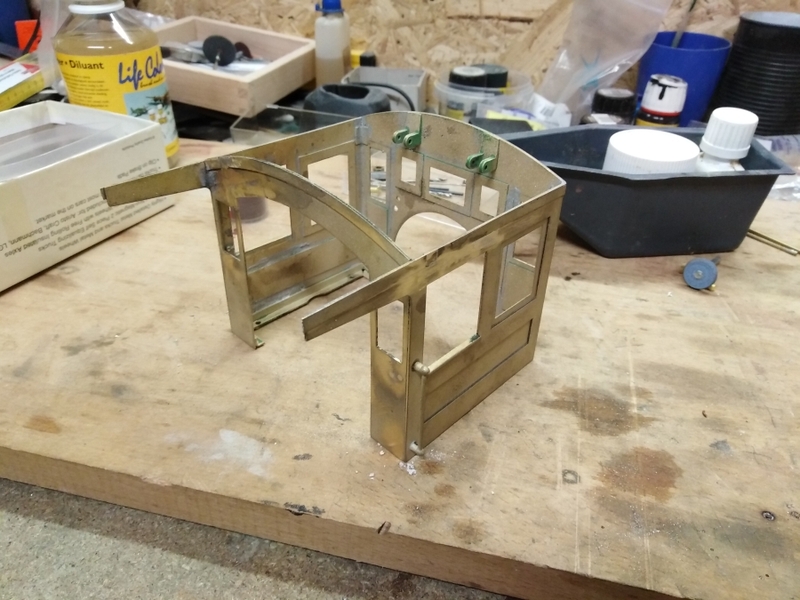 Before that, I un-soldered the tender brackets, which will get relocated as well, while my tender frame is narrower then the original one. 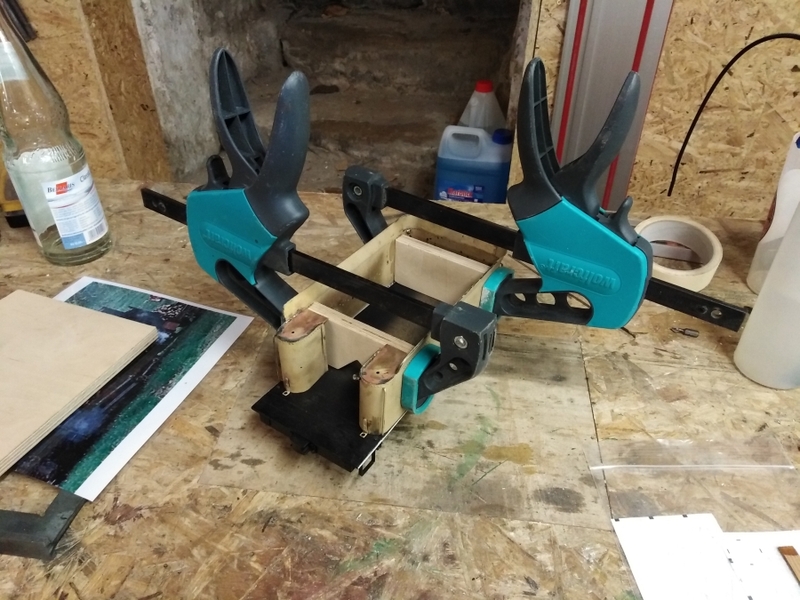 Another task was to fill in the holes in the tender shell. 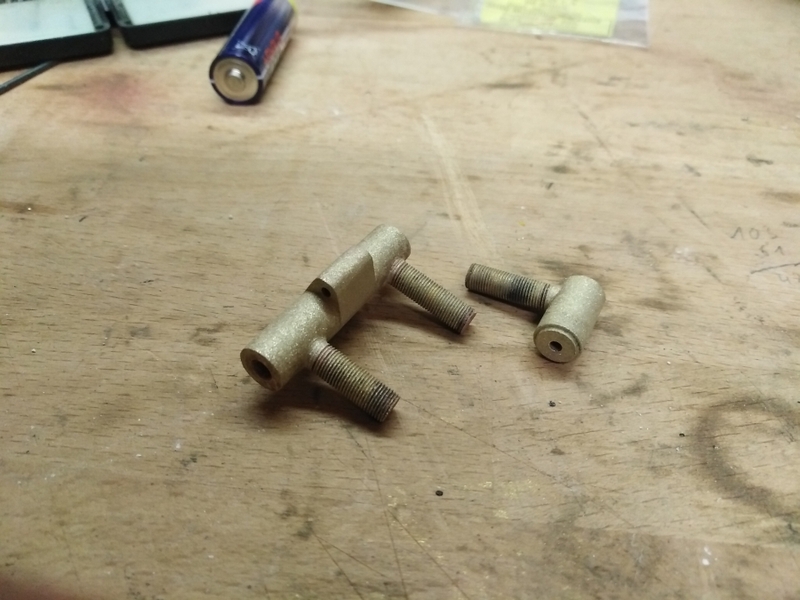 I mad small plugs on the lathe and soldered them into the holes. Then I sanded them flush with the tender shell on both sides. Once these are sandblasted and painted again, they wont be visible. The fixed tender body does look much better now. Still missing were two new brass sheets to cover the front deck of the tender tank. Here you can see the tender brackets back in place at a right angle to the tender ends. 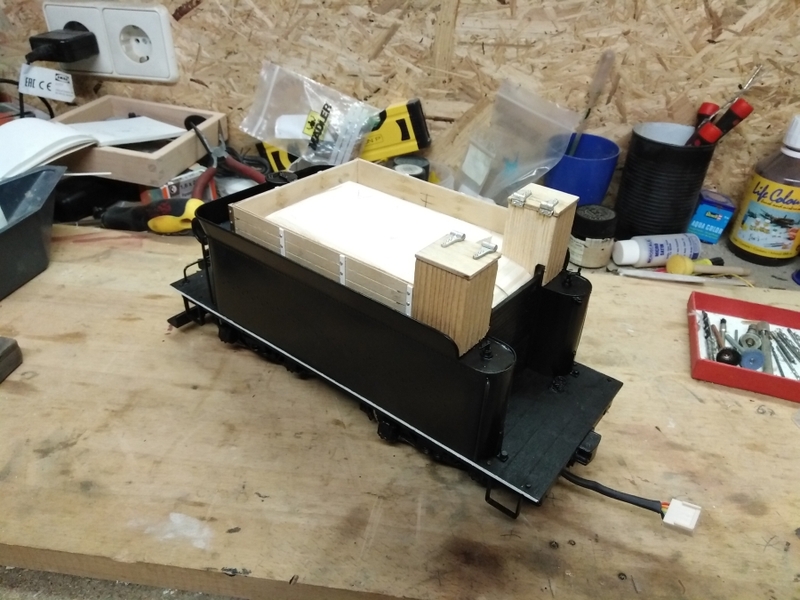 As the inner parts of the original tender were no longer useful, I removed them and decided to install a wooden interior to the tender. 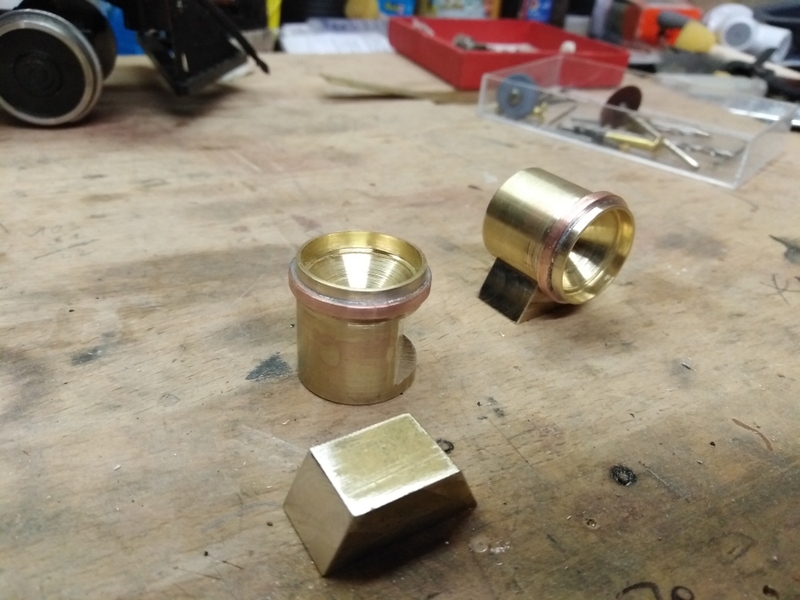 I epoxied two blocks of 1/2″ plywood at the far ends into the brass shell. 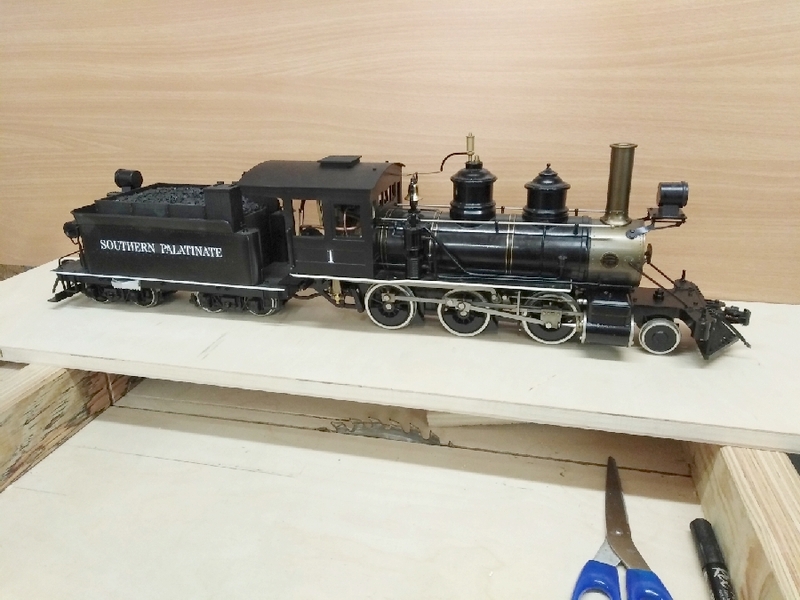 Later I added the top from 2mm plywood.The whole wooden part will be hidden by the coal bunker above, so I’m happy with this solution. At the rear end of the tender, I placed the air tank, which was originally located under the cab. I use several Colorado & Southern Moguls for inspiration on this project. There are still lots of details missing and paint off course. 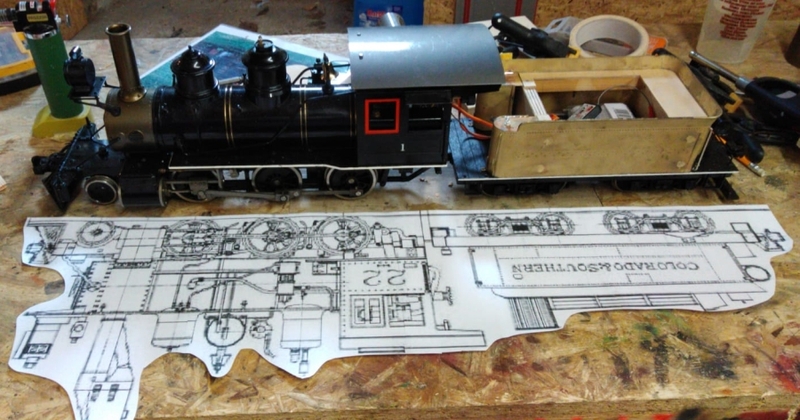 I printed a line drawing of C&S Mogul #22 in 1:20.3 scale and compared this with my loco. 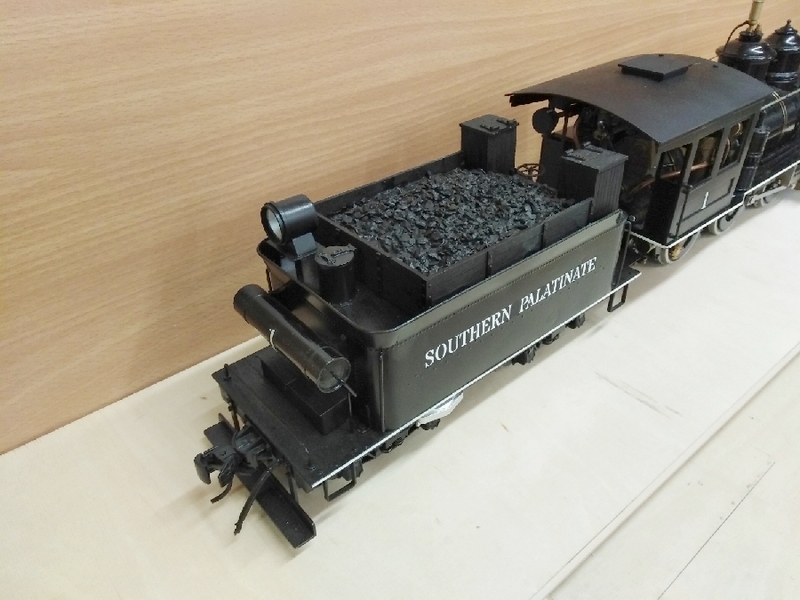 The tender is a bit shorter on my engine, while the boiler is longer. The wheelbase matches neraly perfect. As I don't model a specific prototype, I'm very happy with the result so far. 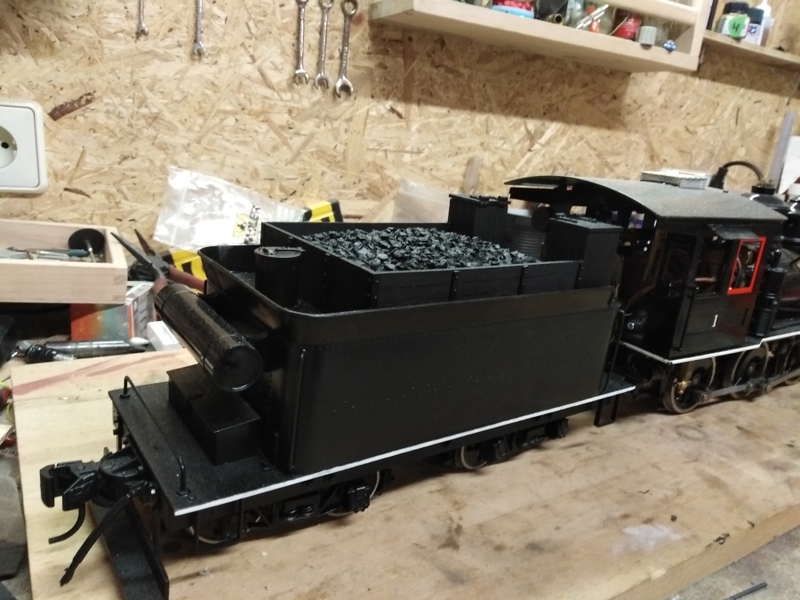 You can also see that I managed some further progress on the tender in the meantime - I'll share the details later this week. awesome looking with the shorter wheel base . Thanks David, by now, the rebuild works better than expected, also the result. 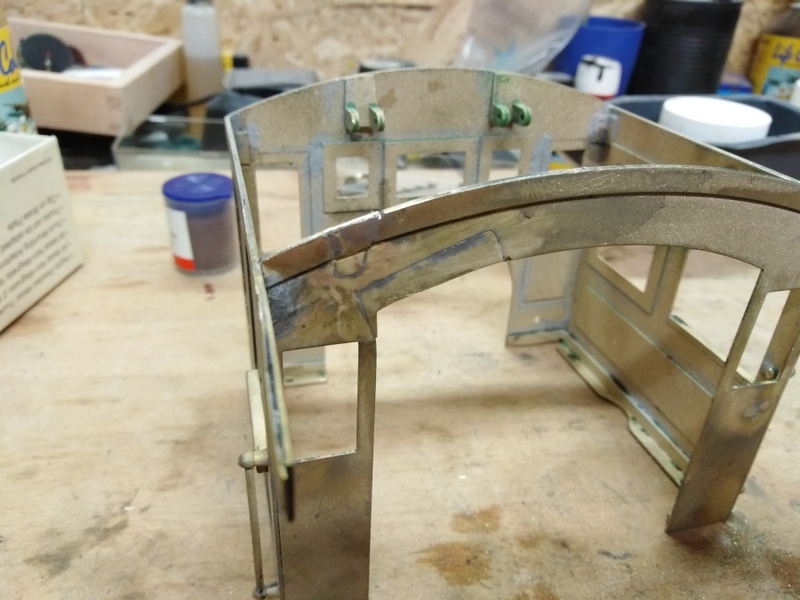 I started to sand-blast the paint off the tender shell, but that paint is very sticky on the brass sheets. This will take some while. Our local steam group headed by Mr Wee Bee Loco Works (Jim Sanders) himself, set up the portable layout at the NMRA winter show in Noblesville Indiana last Sunday. Here is a short video of my Stainz pulling 3 LGB coaches, which would be the prototype train length hauled by the tiny prototype. Slowly getting better with each running as things get run in. A minor valve timing adjustment after this run yielded even slower speeds without stalling or uneven speed.